Scientists begin to map brain stimulation sites and pathways. Over the past several decades, brain stimulation has become an increasingly important treatment option for a number of psychiatric and neurological conditions. Divided into two broad approaches, invasive and noninvasive, brain stimulation works by targeting specific sites to adjust brain activity. The most widely known invasive technique, deep brain stimulation (DBS), requires brain surgery to insert an electrode and is approved by the U.S. Food and Drug Administration (FDA) for the treatment of Parkinson’s disease and essential tremor. Noninvasive techniques, including transcranial magnetic stimulation (TMS), can be administered from outside the head and are currently approved for the treatment of depression. Brain stimulation can result in dramatic benefit to patients with these disorders, motivating researchers to test whether it can also help patients with other diseases. But, in many cases, the ideal sites to administer stimulation have remained ambiguous. Exactly where in the brain is the best spot to stimulate to treat a given patient or a given disease? Now a new study in the Proceedings of the National Academy of Sciences (PNAS) helps answer this question. Led by investigators at Beth Israel Deaconess Medical Center (BIDMC), the findings suggest that brain networks, the interconnected pathways that link brain circuits to one another, can help guide site selection for brain stimulation therapies. Although different types of brain stimulation are currently applied in different locations, the team found that the targets used to treat the same disease are nodes in the same connected brain network. This may have implications for how the medical community administers brain stimulation to treat disease. If a neurosurgeon wants to treat Parkinson’s disease or tremor with brain stimulation, they can insert an electrode deep in the brain and get a great effect. However, getting this same benefit with noninvasive stimulation is difficult, as they can’t directly stimulate the same site deep in the brain from outside the head. However, by looking at the brain’s own network connectivity, researchers can identify sites on the surface of the brain that connect with this deep site, and stimulate those sites non-invasively. Brain networks consist of interconnected pathways linking brain circuits or loops, similar to a college campus in which paved sidewalks connect a wide variety of buildings. In the current study the team that first conducted a large-scale literature search to identify all neurological and psychiatric diseases where improvement had been seen with both invasive and noninvasive brain stimulation. Their analysis revealed 14 conditions; addiction, Alzheimer’s disease, anorexia, depression, dystonia, epilepsy, essential tremor, gait dysfunction, Huntington’s disease, minimally conscious state, obsessive compulsive disorder, pain, Parkinson disease and Tourette syndrome. They next listed the stimulation sites, either deep in the brain or on the surface of the brain, thought to be effective for the treatment of each of the 14 diseases. The researchers wanted to test the hypothesis that these various stimulation sites are actually different spots within the same brain network. 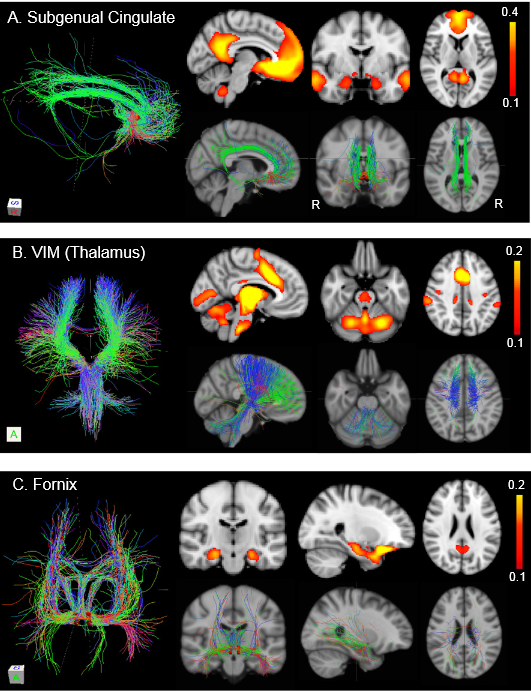 To examine the connectivity from any one site to other brain regions, the team used a data base of functional MRI images and a technique that enables you to see correlations in spontaneous brain activity. From these correlations, the investigators were able to create a map of connections from deep brain stimulation sites to the surface of the brain. When they compared this map to sites on the brain surface that work for noninvasive brain stimulation, the two matched. These results suggest that brain networks might be used to help the medical community better understand why brain stimulation works and to improve therapy by identifying the best place to stimulate the brain for each individual patient and given disease. This study illustrates the potential of gaining fundamental insights into brain function while helping patients with debilitating diseases, and provides researchers with a powerful way of selecting targets based on their connectivity to other regions that can be widely applied to help guide brain stimulation therapy across multiple neurological and psychiatric disorders. The team state that when trying different types of brain stimulation for different diseases, the question comes up, how does one relate to the other?. In other words, can the medical community use the success in one to help design a trial or inform how they apply a new type of brain stimulation? The new findings suggest that resting-state functional connectivity may be useful for translating therapy between treatment modalities, optimizing treatment and identifying new stimulation targets. displayed brain slices are, x = −6, y = −4, z = 28 (A); (x = −6, z = −24, z = 38 (B); and y = −18, x = 26, z = 24 (C). R, right. Resting-state networks link invasive and noninvasive brain stimulation across diverse psychiatric and neurological diseases. Pascual-Leone et al 2014.